PARIS -Swedish authorities planning to host flights of the Virgin Galactic suborbitalspace plane hope to lower the costs and regulatory barriers to the operation byhaving it classed as a sounding rocket and given the tax advantages of hot-airballoon flights, Swedish and Virgin Galactic officials said April 1. 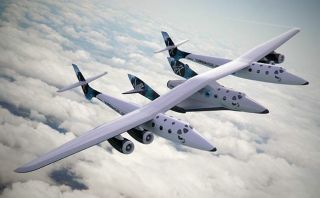 London-basedVirgin Galactic, whose SpaceShipTwo craft and its WhiteKnightTwo mother ship arenearing completion by Scaled Composites of Mojave, Calif., remains onschedule to begin test flights this summer, Virgin Galactic President WillWhitehorn said. Addressinga press briefing at Sweden?s Esrange launch site, which is being prepared asVirgin Galactic?s secondlaunch site after Sierra County, N.M., Whitehorn said the Virgin Galacticis sticking with its earlier estimates of being able to field its space launchsystem for about $250 million. He said about $100 million has been spent sofar. Some 250prospective customers have made $35 million in flight deposits with VirginGalactic. The flight ticket is $200,000 per person for a two-hourflight that will include perhaps five minutes of weightlessness as the shipapproaches the limits of the Earth?s atmosphere at 100 kilometers in altitude. Sven Grahn,senior advisor to the Swedish Space Corp., which operates the Esrange launchfacility in the northern Swedish town of Kiruna, said Esrange?s long history asa site for launches of suborbital sounding rockets has established a regulatoryregime in Sweden to cover third-party liability that also could also apply toinclude Virgin Galactic operations. To reducethe value-added tax that would be levied on applied to Virgin Galacticoperations, Grahn said Swedish Space Corp. is investigating whether thespace-tourism activity could be fitted into the same low-tax regime that coversthe operations of hot-air balloons. Value-addedtaxes in Sweden run as high as 25 percent. Grahn saidthat while space law in Europe remains the responsibility of individualnations, aviation law authority is slowly migrating slowly to the EuropeanUnion. He said it remains unclear whether European or Swedish aviationregulations will apply to space tourism from Swedish territory. As he hasin the past, Whitehorn conceded that while the design and composite-materialsconstruction using composite materials of SpaceShipTwo and WhiteKnightTwo havecaptured most of the attention, many of the hurdles that the company needs toovercome relate to the more prosaic issues of regulatory approval and insurancecoverage. Space-tourismindustry officials have said that their obvious early market, high-net-worthindividuals, presents the risk that, in the event of an accident, passengers?families would seek to overturn in court the liability waivers that customerswill sign. If such an action is viewed as likely, Virgin Galactic will havedifficulty securing insurance coverage. After itsflight tests this summer, Virgin Galactic will need to be certified asflight-worthy by the U.S. Federal Aviation Administration. Only aftercertification occurs will the company have a clear idea of when its firstflights will be. But Whitehorn said 2009 remains the target. For the Swedishoperation, flights could begin in 2012 or 2013, he said. As is thecase in New Mexico, Virgin Galactic is not investing in the development of theSwedish spaceport. In Sweden, Esrange already has a suitable airport and alarge hangar that can be used by Virgin Galactic. Swedish Space Corp. officialshope to make the business case for space tourism based on from revenuesexpected from paying customers pace-tourism passengers and accompanyingpersonnel. The Swedishflights would feature what Kiruna Mayor Kenneth Stalnacke referred to as?surfing through the northern lights,? the Aurora Borealis, during themidsummer and mid-winter months. StephenAttenborough, Virigin Galactic?s commercial director, said the company?searlier estimate that 80 percent of its prebooked passengers would pass aphysical exam now looks overly cautious. Attenboroughsaid a sample group of 80 Virgin Galactic customers - including one 88-year-old- have been put through the stresses of a centrifuge in Philadelphia to testtheir ability to withstand the g-force loads expected during a VirginGalactic flight. Only twowere disqualified, with three others asked to provide supplemental medicalinformation, Attenborough said. Based on this experience, Virgin Galactic nowassumes that 90 percent or more of those reserving flight slots will pass thepreflight medical exam.